In Build 2018 Microsoft interduce the preview of ML.NET (Machine Learning .NET) which is a cross platform, open source machine learning framework. Yes, now its easy to develop our own Machine Learning application or develop costume module using Machine Learning framework.ML.NET is a machine learning framework which was mainly developed for .NET developers. We can use C# or F# to develop ML.NET applications.ML.NET is an open source which can be run on Windows, Linux and macOS. The ML.NET is still in development and now we can use the preview version to work and play with ML.NET. 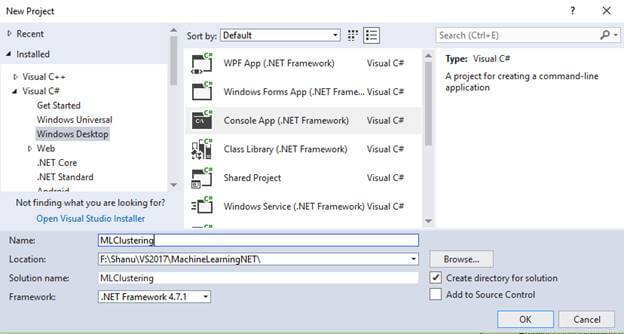 In Build 2018, Microsoft introduced the preview of ML.NET (Machine Learning .NET) which is a cross-platform, open source machine learning framework. Yes, now it's easy to develop our own Machine Learning application or develop custom modules using a Machine Learning framework. ML.NET is a machine learning framework which was mainly developed for .NET developers. 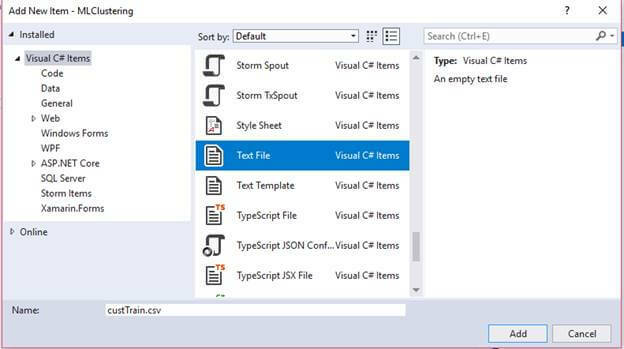 We can use C# or F# to develop ML.NET applications. ML.NET is open source and can be run on Windows, Linux, and macOS. The ML.NET is still in development, however, we can use the preview version to work and play with ML.NET. Here are the reference links. In this article, we will see how to develop our first ML.NET application to predict the item's stock quantity. Machine Learning is nothing but a set of programs which is used to train the computer to predict and display the output for us. Examples of live applications which are using Machine Learning are Windows Cortana, Facebook News Feed, Self-Driving Cars, Future Stock Prediction, Gmail Spam detection, Paypal fraud detection, etc. Machine gets labeled inputs and their desired outputs. For example, Taxi Fare detection. Machine gets inputs without desired outputs. Example - Customer Segmentations. In this kind of algorithm, we will interact with the dynamic interaction. For example - Self-Driving Cars. In each type, we will be using an algorithm to train the machine for producing results. We can see the algorithm for each machine learning type. In my previous article, I have explained about predicting future stock for an item using ML.NET for the regression model for supervised learning. In this article and sample program, we will see how to work on a clustering model for predicting mobile sales by model, gender, before 2010 and after 2010 using the clustering model with ML.NET. For working with Machine Learning first we need to pick our best fit machine learning algorithm. Machine learning has clustering, regression, classification and anomaly detection modules. Here in this article we will be using the Clustering model for predicting the Customer Segmentation of mobile phone usage. We need to train the machine learning model. Training is the process of analyzing input data by model. The training is mainly used for the model to learn the pattern and save it as a trained model. For example, we will be creating a csv file in our application and in the csv file we will be giving the Customer details as Male, Female, Before2010 and After2010 and MobilePhone type for the Input. We give more than 100 records in the csv file as samples with all the necessary details. We need to give this csv file as input to our model. Our model needs to be trained and using this data, our model needs to be analyzed to predict the result. The predicted result will be displayed as Cluster ID and scored as distance to us in our console application. Score here is not the same as our regression model, where in Regression we will be having the labeled input as well as labeled output, but for the Clustering model we don’t have the desired output here in score will contain the array with squared Euclidean distances to the cluster centroids. 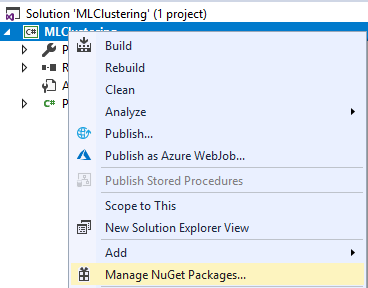 Ref link - ML.NET to cluster. 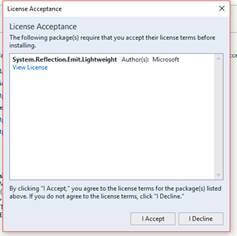 Click on Install, I Accept and wait until the installation is complete. 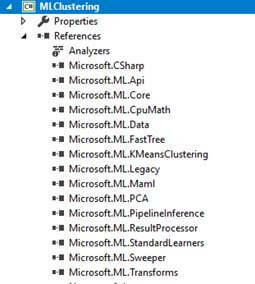 We can see the Microsoft.ML package has been installed and all the references for Microsoft.ML has been added in our project references. Now we need to create a Model training dataset. For creating this we will add csv file for training the model. We will create a new folder called Data in our project to add to our csv files. Here we have added the data with the following fields. MobilePhone – Mobile Phone Type. In our class, first we need to import the Microsoft.ML.Runtime.Api for column and ClusterPrediction Class creation. Next, we need to add all our columns, like our csv file, in the same order in our class and set the column from 0 to 3. Important to note is that in the prediction column we need to set the column name as the “Score” and also set the data type as the float for Score and for PredictedLabel set as uint. 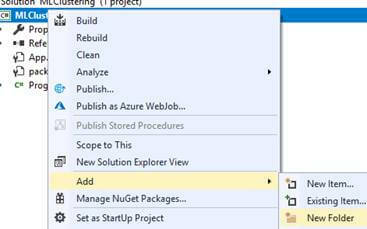 To work with ML.NET we open our “program.cs” file and first we import all the needed ML.NET references. The final trained model needs to be saved. For this we set modelpath with the “custClusteringModel. zip” file. The trained model will be saved in the zip fil automatically during runtime of the program in our bin folder with all needed files. 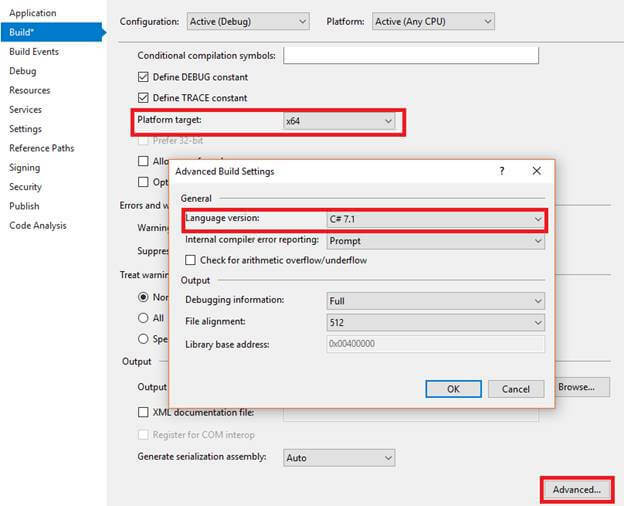 First is to set Platform Target as x64.The ML.NET only runs in x64, for doing this right click the project and select properties >> Select Build and change the Platform target to x64. First, we need to train the model and save the model to the zip file. For this in our main method we call the predictionModel method and pass the CustData and ClusterPrediction class and return the model to the main method. In training the first step will be working the LearningPipeline(). The TextLoader is used to get all the data from the train csv file for training and here we set the useHeader:true to avoid reading the first row from the csv file. Next, we add all our columns to be trained and evaluated. The learner will train the model. We have selected the Clustering model for our sample and we will be using KMeansPlusPlusClustererlearner. KMeansPlusPlusClusterer is one of the clustering learners provided by the ML.NET. Here we add the KMeansPlusPlusClusterer to our pipeline. We also need to set the K value as how many clusters we are using for our model. Here we have 3 segments as Windows Mobile, Samsung, and Apple so we have set K=4 in our program for the 3 clusters. Now it's time for us to produce the result of predicted results by model. For this we will add one more class and, in this Class we will give the inputs. We add the values to the TestCustDataClass which we already created and defined the columns for Model training. 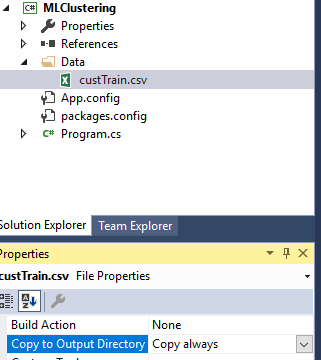 We can see in our custTrain.csv file we have the same data for the inputs. In our program's main method, we will add the below code at the bottom after the train method to predict the result of ClusterID and distances, and display the results from the model to users in the command window. ML.NET (Machine Learning DotNet) is a great framework for all the dotnet lovers who are all looking to work with machine learning. Now only the preview version of ML.NET is available and I can’t wait till the release of the public version of ML.NET. Here in this article I have used the clustering for Unsupervised type. If you are .Net lovers, and are not aware about Machine Learning and are looking forward to working with machine learning then ML.Net is for you. It's a great framework for getting started with ML.NET. Hope you all enjoy reading this article and see you all soon with another post.